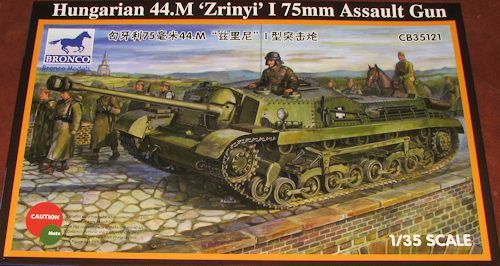 Following the German success with their StuG assault guns on the World War II Eastern Front, the Hungarians developed their own model, based on the chassis of the Turán tank. There were two designs, the 44M Zrínyi I, incorporated a long 43M 75mm gun, but it did not pass the prototype stage. The 40/43M Zrínyi II was armed with a 40M 105mm L/20 howitzer. Never one to miss gettting the most out of a set of tooling, Bronco has provided us with what is possibly the lone 44M prototype. To my mind, this one looks a lot nicer than the later version that was accepted into service. But when one has to choose between a big gun and a smaller one, the smaller one will win out all the time. Not unexpectedly, this one lives up to the high standard of quality and detail that Bronco has earned over the years. When I look at some of their initial offerings, it shows how much they have improved. 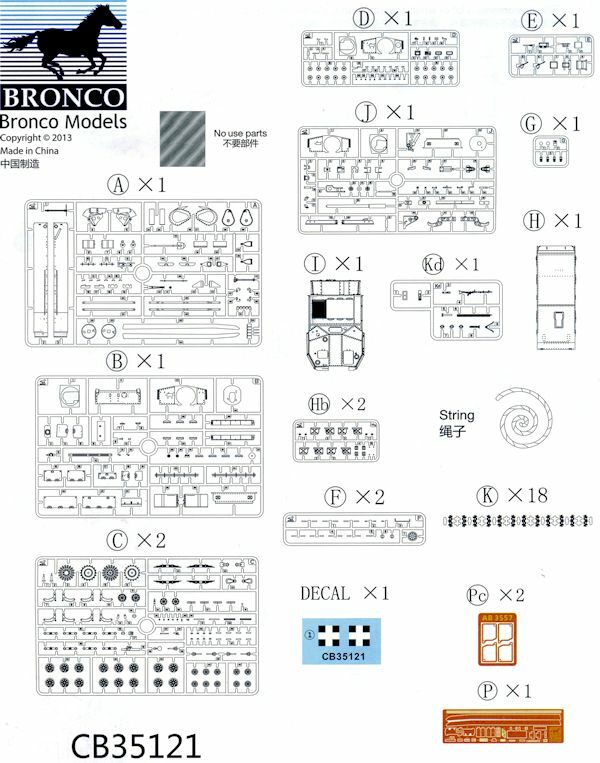 One thing I have come to like about Bronco kits is that though they may not give you a full interior, they do give you driver's compartments and this one is no exception. It is nice to have something to look at if you decide to leave the driver's hatch open. This one also sets up the road gear to build each bogie set as a complete assembly before attaching it to the main hull. The ones on the Zrinyi I are one of the more interesting and complex that I've seen in a kit. This is another case of building up the assemblies, painting them and the hull to which they attach the base color and then going back and doing the rubber on the road wheels and return rollers. The kit also continues the trend of using individual track links. These apparently snap together as the instructions show no gluing. The upper hull is resplendent in its riveted wonder. 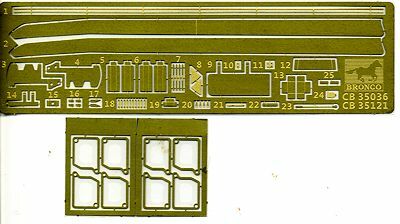 One will have to add several rivets from those attached to the sprues in a few areas and the instructions show precisely where to do that. All of the various hatches can be posed open or closed, though with no engine and no interior save the driver's area, you'll probably want to keep those closed. The 75mm gun is a superb construct that includes the breech and is designed to be able to be moved in elevation and azimuth, though not by much. One can also pose the breech open or closed. The photo etch is mostly used for braces, small brackets, covers and other tiny details that are appropriate for the media. This includes the sand shields on the side of the fenders. P.e. is used for the Jerry cans as well. A section of thread is provided for the tow cable. Instructions are very nicely done with well drawn construction steps. No underway color info is provided. However, a nice full color painting guide is provided for the overall vehicle. This is basically an overall green drab. The small decal sheet provides two insignia. Now we have a neat Hungarian prototype that is sure to be sought by those who tire of Shermans and Germans. It makes for an interesting comparison to the German StuGs and the Soviet SUs.